The ECO850LCD ultra-compact green UPS offers complete protection from blackouts, voltage fluctuations and transient surges. Interactive LCD user interface offers detailed UPS and site electrical data, including input/output voltage, estimated runtime remaining, load percentage, load wattage and battery charge level. Energy saving ECO outlets give users the option to automatically power off unused desktop accessories like a printer and audio speakers as the computer connected via USB goes to low-power sleep or shutdown modes. 99% full load efficiency rating offers energy savings and cool operating temperatures. Green eco-friendly design meets strict RoHS environmental standards. Provides uninterruptible transfer to battery derived AC output during power failures and voltage fluctuations with enough runtime to save and shutdown connected equipment without data loss. Space saving, ultra-compact desktop or wall mount compatible housing. 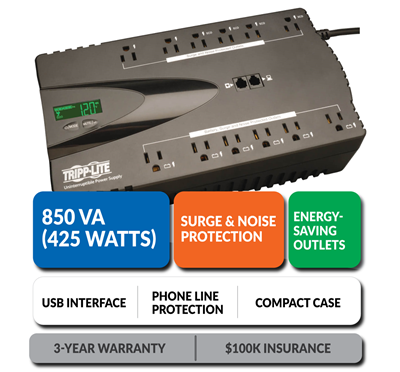 Includes 6 battery supported outlets for computer, monitor and four vital system accessories, plus 6 additional surge suppression-only outlets for accessories not requiring battery support. Four surge-only outlets marked “ECO” can be configured to automatically power-off within 3 minutes of the connected computer entering sleep or shutdown mode. USB monitors computer power status for ECO power savings and enables direct integration with built-in power management and auto-shutdown features of Windows and Mac OS X. PowerAlert software is available via free download to provide advanced auto-shutdown, UPS monitoring and data saving options. USB cable included. Built-in single line RJ11 phone suppression protects modem, fax machine, cordless phone or other accessories with a dial-up/DSL phone connection. Built-in interactive LCD screen offers continuous power and UPS status information. Audible alarm warns of power failure conditions. Self-test, display brightness, alarm disable and LCD information display scrolling options are controllable via interactive LCD user interface. 850VA / 425 watt UPS capacity supports entry-level PC systems for up to 45 minutes during power fail conditions. This eco-friendly UPS system protects your valuable equipment from damage, downtime and data loss. The ultra-compact, low-profile case saves space. Energy-saving outlets help prevent idle equipment from wasting electricity. Computers and network hardware are under constant attack from power problems. Even a brief loss of power or a momentary surge can damage your equipment, corrupt your data and disrupt your network. This UPS system conditions incoming AC power to protect your equipment, provides enough battery backup to outlast most outages and allows your computer to shut down gracefully during extended blackouts, preventing data loss. This highly efficient UPS system also helps you save money by reducing your electric bill. Special energy-saving outlets prevent idle equipment from wasting electricity, which can reduce your bill as much as $50 per year. Every AC adapter and glowing LED represents a potential "phantom load," which is electricity wasted by an idle device, even when it appears to be turned off. This UPS system helps eliminate phantom loads by automatically cutting power to special energy-saving outlets when your USB-connected computer shuts down or enters standby mode. Other outlets stay on to support devices that operate continuously, such as wireless routers. When your computer starts up again, the UPS automatically restores power to the energy-saving outlets and your entire system is ready to use. Single-Computer Runtime: This UPS system will support an energy-efficient desktop computer and LCD monitor (100W load) for up to 30 minutes during an outage. Half-Load Runtime: This UPS system will support a 50% load (210W) for up to 13.4 minutes. Optimized Outlet Array: 6 outlets have both battery backup and surge/noise protection, and 6 have surge/noise protection without battery backup. The "surge-only" outlets allow you to connect additional equipment without overloading the UPS or reducing the backup runtime available during an outage. Select outlets have extra-wide spacing to accommodate bulky AC adapters without blocking adjacent outlets. Use the multifunction LCD screen. The illuminated LCD screen shows a variety of helpful data, including input/output voltage, estimated battery backup runtime remaining, load percentage, load wattage and battery charge percentage. You can also use the LCD to control a number of UPS features, including energy-saving mode enable/disable, self-test, alarm enable/disable and LCD brightness. 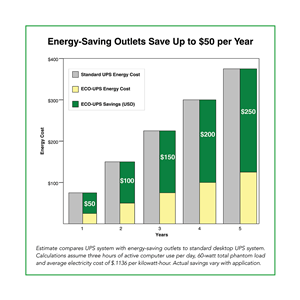 Energy-Saving Outlets: This UPS system also has special energy-saving outlets that prevent "phantom" or "vampire" loads from wasting electricity when equipment is not being used.